Hive Connected Home products are great and the support is outstanding, but they will crash… or at least ours did and here’s what we hope is an interesting analysis in terms of trying to work out where the faults could crop up in the new world of the Internet of Things (IoT). Consider the facts and follow the logic if you will please. 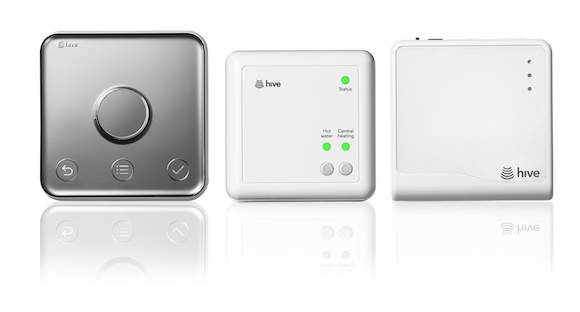 The Hive Hub – the unit that sits in your boiler or immersion room area to drive the ON/OFF functions of heating and hot water (middle picture below). The router extension – the unit that takes a direct feed out of your home Internet box to provide wireless connectivity to Hive devices (not shown). The thermostat – it is what it is, it’s a thermostat and it’s digital and attractive and it can be used to turn heat up or down and programme a schedule and put the hot water ON/OFF (left picture below). The Hive app, on your smartphone or tablet. So consider the scenario in our use case. The Hive thermostat was working correctly and talking to the router extension and onward to the rest of the system, the heating could be controlled perfectly. But, the app failed to synchronise with the home devices despite several reboots, reset passwords and re-installations. Foolishly (it turns out) a factory reset on the thermostat was executed. This is easy to do, the user simply holds down all three bottom buttons and in fact just the two on the left (menu, and back) will do it. This leaves the thermostat unable to connect with the router in any form and the only means of turning the heating and hot water ON/OFF is by the Hive Hub in your immersion cupboard – no ‘control’ of temperature is then possible, simply ON/OFF. The solution is Maureen from Kenya in the Glasgow call centre, who (bless her heart) works on a Sunday and knows the system back to front. She can also reboot remotely and make everything right again – all you need to do is provide your name and postcode regardless of your energy supplier. So here’s the question, if the system is working internally so-to-speak without a web app connection, but the core ‘app’ application fails to be able to syncronise, then surely the app and the higher level systems engineering has outstripped the middleware on the devices, which have been left with the ability to talk to each other, but stripped of the ability to connect to the outside world. Surely the firmware or middleware on the devices themselves has become stale and outdated. Lessons learned… do not necessarily perform a factory reset on any IoT device if there’s a good call centre option and do check all wire connections and battery performance in remote unit devices first… and when all that fails, call Maureen, she’s lovely.